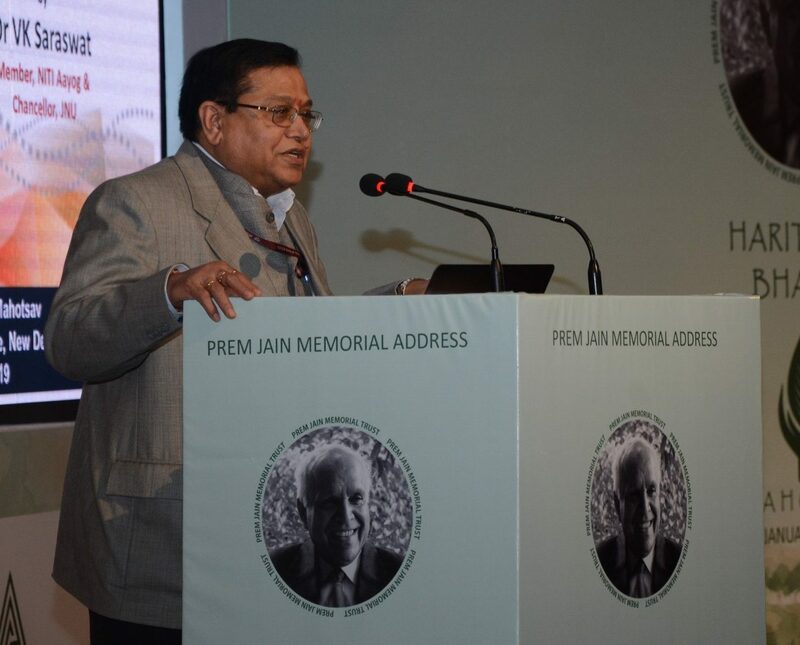 New Delhi, February 9, 2019: Prem Jain Memorial Trust, a Trust founded in the memory of (Late) Dr. Prem Jain, promoted sustainability and love for mother nature through weeklong celebrations titled “Harit-Prem Bharat Mahotsav” from January 23 to 29, 2019. 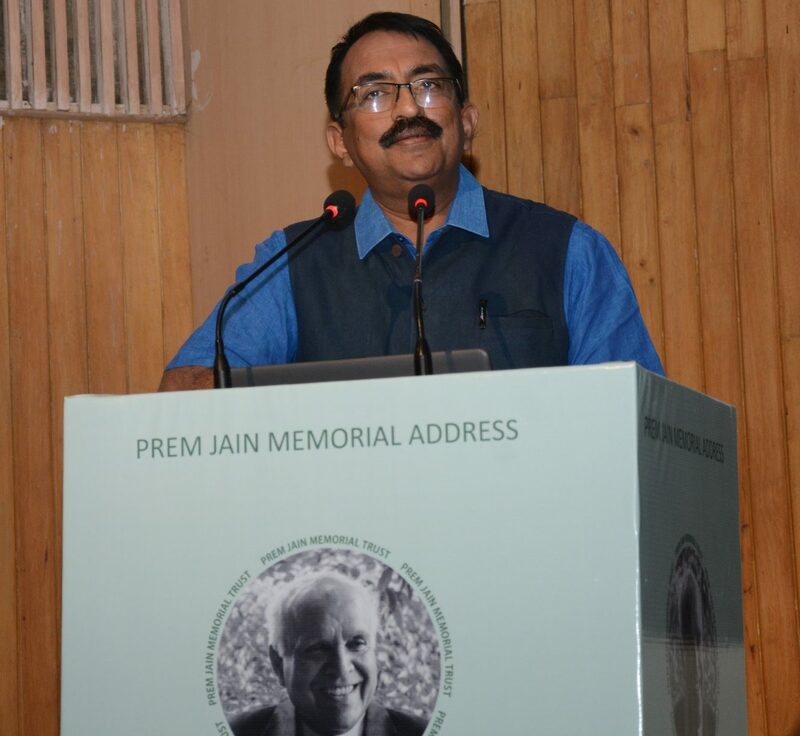 To mark this occasion, the Prem Jain Memorial Address was organised on January 28, 2019 at Stein Auditorium, India Habitat Center, New Delhi. The Chief Guest, Padma Shri and Padma Bhushan – Dr. V.K.Saraswat, presently member of NITI Aayog, i.e. Planning Commission of India and Chancellor, JNU, and Keynote Speaker, Padma Shri Architect – G. Shankar, were present to address the audience on this special occasion. These renowned personalities addressed a young audience that included students, architects, engineers and other professionals. “It is my honour to be here at the Memorial Address for a great son of the soil,” said Dr. V.K.Saraswat, Padma Shri and Padma Bhushan; presently member of NITI Aayog, i.e. 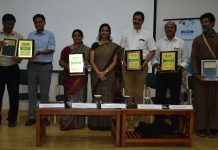 Planning Commission of India and Chancellor, JNU and Keynote Speaker on ‘Smart Cities for Sustainable Development’. Harit-Prem Bharat Mahotsav is supported by prestigious industry societies like Indian Green Building Council (IGBC/CII), Indian Society of Heating, Refrigeration and Airconditioning Engineers (ISHRAE), American Society of Heating, Refrigeration and Airconditioning Engineers (ASHRAE), Indian Plumbing Association (IPA), Defense, Infrastructure Planning and Management Council of India (DIPM), Fire Security Association of India (FSAI), as well as premiere academic institutions like School of Planning and Architecture (SPA), Gateway University, Amity College and Apeejay College through their pan-India networks. 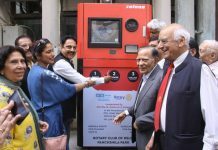 As part of the weeklong celebrations, these affiliated societies and institutions undertook various activities across the country like organising lecture series, essay writing and painting competitions for students, and sapling plantation drives. The Prem Jain Memorial Address shall be organised annually during Harit-Prem Bharat Mahotsav to promote sustainability and create green communities. The mission of Prem Jain Memorial Trust is to create, establish and maintain sustainability paradigm through education, recognition and nurturing of our present and future generations. The Trust aims to identify future leaders who can be a catalyst for global development of sustainability and can create awareness and advocacy about the environment. 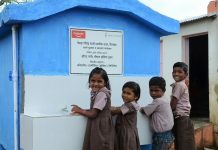 It also wishes to nurture India’s young talent by educating and informing them about sustainable development ecosystems. Dr. Prem Jain, architect of the modern green building movement has ushered in a paradigm shift in the way buildings are conceived and designed worldwide. He has facilitated that India stands tall in the global green building movement and aspired for Bharat to emerge as Jagat Guru in Sustainable Built Environment. 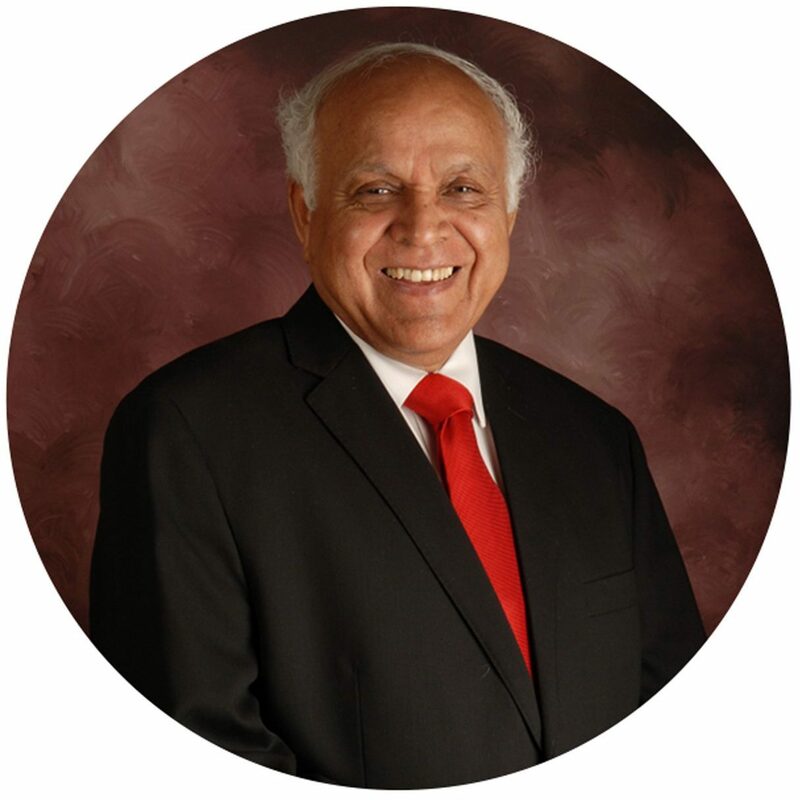 Dr. Prem Jain graduated from Banaras Hindu University in 1957 and obtained the highest honor of double Ph.D in Mechanical and Electrical Engineering, from University of Minnesota, USA in 1965. With an idea to build a consultancy firm, which would continue after him, he created SPECTRAL in 1980, taking it to the country’s most respected, premiere consulting firm in MEP design over the next three decades, with over 700 family members and nine locations across India. Through his career, he designed services for Vigyan Bhawan, AIIMS, Bahai Temple Extension, Siddhi Vinayak Temple, Osho Ashram Pune, and several iconic projects. He had the distinction of being the Honorary Advisor to The President of India, for the air-conditioning of the Darbar Hall, Rashtrapati Bhawan, New Delhi. He was also Personal Technical Advisor to PMO, from 1984 to 1990, and was involved in design of services systems for PM Office in South Block and offices in North & South Block. Since Spectral had designed energy efficient and fire safe buildings for three decades, he was invited to design the first Green Business Centre in Hyderabad. Indian Green Building Council (IGBC) was founded and the Spectral team designed Godrej Green Business Centre, which received the highest LEED Platinum Rating from USGBC in 2003, and became the world’s greenest building in March 2004. He led the way to a record high of 60 platinum and 40 gold awards from IGBC & USGBC, for design of green buildings in India. He brought to India many international awards like Lifetime Achievement Award from Marquis Who’s Who in the World; ASHRAE’s highest honour – Distinguished Fellow ASHRAE, and many more. He founded ISHRAE, which now has more than 12,000 members and 8,000 student members. ISHRAE & ASHRAE India has bestowed upon him their Lifetime Achievement Award. Dr. Jain became Chairman of Indian Green Building Council (IGBC) in 2007, driving awareness amongst India about a greener way of life. His dream was to make India the world leader in Green. Dr. Prem Jain is revered in India as the “Father of Green Buildings”. He worked relentlessly to create 23 chapters of IGBC across India; each led by an eminent leader and a 2,500 member strong organisation. He was instrumental in launching over 150 IGBC student chapters in various colleges. Dr. Jain envisioned 10 billion sq.ft of green building footprint by 2022. India reached one billion sq.ft of registered green footprint with IGBC in 2012, three years ahead of schedule. Under his guidance, IGBC launched 25 green building rating systems, one for each specialised application such as affordable housing, green homes, green cities, green villages and green townships. As of November 2018, over 4,900 projects, amounting to over 6.4 billion sq.ft of green are adopting IGBC standards. Today, India is the second country in the world in terms of registered green footprint. Dr. Jain facilitated suitable policy incentives from the States including Rajasthan, Punjab, West Bengal, Uttar Pradesh, Andhra Pradesh, Himachal Pradesh, Jharkhand and Haryana, which now offer policy incentives for IGBC-rated green building projects. 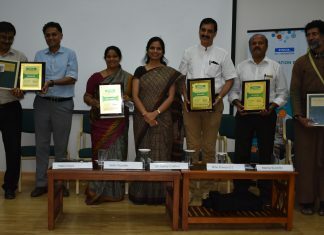 Dr. Jain institutionalised Green Building Congress – India’s annual flagship event on green buildings; 15 successful editions of GBC are a testimony to his vision. He also facilitated market transformation of green products and technologies and IGBC estimates market potential today to be roughly USD 300 billion by 2025.